On 5 March I attended the first of the Anna Craft memorial lectures which will be given annually in commemoration of the life and work of this influential educator and Co-Director of the Cambridge Primary Review Trust. It was a bittersweet occasion, shared with Anna’s colleagues from multiple arts and cultural organisations, universities and schools and her family and friends. The 150 seats went within the first fortnight and a waiting list grew rapidly, testifying to the esteem in which Anna’s work is held; it remains an important force in the shaping of theory and practice in creativity and education. Anna would have been honoured by the words of Sir Ken Robinson, who gave the first lecture, entitled ‘Educating for Creativity: From what is to what might be’; he described her contribution as ‘immense’. Filmed in Los Angeles, the lecture was shown simultaneously at the Open University’s centre in Camden (where I was) and at Exeter University (she was working in both universities at the time of her death at just 52 years old). The intention of the annual lecture series is to help sustain her legacy and to disseminate the best contemporary thinking about creativity and education, both in the UK and internationally. Ken Robinson began by masterfully dismissing some of the myths of creativity: that it is ‘rare’, an attribute of ‘special’ people or that you are either creative or you are not, an absurd idea, since as Ken observed; ‘if you’re human it comes with the kit’. He also asserted that confusion remains over the concept itself. In his view, this is one of the key reasons that creativity in education is still not taken seriously by policy makers. This was a timely reminder that as educators and researchers if we cannot agree our terms, we will not be able to teach for creativity nor document the impact of children’s creative learning. As Csikszentmihalyi notes, the education profession lacks a commonly accepted theoretically underpinned framework for creativity that can be developed in practice. Without common understanding new myths will develop, like the one currently circulating about the so called ‘creative curriculum’. I keep hearing this described by teachers as if were an entity, a planned and prescribed monolithic given – delivered in the afternoons – as a form of respite from the morning rituals of literacy and numeracy. Last Saturday, at the London Festival of Education, (run by UCL, Institute of Education), one session was devoted to achieving literacy and numeracy targets creatively through using technology aligned to cross curricula themes. This ‘creative curriculum’ focused on individual set learning tasks and offered sets of planned deliverables. Where, I ask myself, are the children in all this? Where are their voices, their views and their funds of knowledge? How do these shape the curriculum as planned and lived? In the recent CPRT review Children, their voices and their experiences of school: What does the evidence tell us? Carol Robinson highlights that in order to empower children to act as partners in their own learning, they need to be partners in decisions about teaching and learning. A curriculum which is forged creatively through dialogue, collaboration and interaction must surely involve children since, as Anna and Bob Jeffrey argue, creative practice is learner-inclusive and enables children to have some agency and control over their school learning life. One school which seeks to involve children in co-designing the curriculum and fosters creative learning is St Leonards C of E in Devon, a CPRT Schools Alliance institution which is imaginatively led by Jo Evans. Teachers in Jo’s school, as in many others, even in accountability cultures such as ours, can and do choose to exercise their professional agency. Many teachers, encouraged by working with partners from creative and cultural organisations, and determined to offer co-constructed creative curricula, proactively seek out ways to shape their school curricula responsively, drawing on the CPR’s conception of a broad and balanced curriculum. These professionals show considerable commitment and imagination, despite, or perhaps because of, the persistent performativity agenda. For another example, see head teacher Iain Erskine’s account of the work at Fulbridge Academy in Peterborough, also a CPRT Schools Alliance member. Already a National School of Creativity, Fulbridge have adopted CPR’s eight curriculum domains (including that of arts and creativity) from nursery to Year 6; they teach, assess and plan with reference to these. The five staff who recently presented at a CPRT London regional network meeting, on Fulbridge’s approach to assessment without levels, certainly demonstrated that they take risks, have the power to innovate and problem solve – together. Though it has to be acknowledged that these schools may be exceptions to the rule, since in recent years the relentless quest for higher standards has tended to obscure the personal and agentic dimensions of teaching and learning, and may have fostered a mindset characterised more by compliance and conformity than curiosity and creativity. For primary educators tensions abound, not only because the policy of performativity appears contradictory to the apparent freedoms and professional agency offered in political rhetoric, but also because teachers’ own confidence as creative educators has been radically reduced by prescribed curricula and the endless barrage of change and challenge. This has had consequences. The recently published Warwick Commission report, Enriching Britain: Culture, Creativity and Growth, identifies a worrying reduction in emphasis on, and capacity for, creative opportunities in schools, and asserts that the impoverishment of creative experience in the early years is linked to lack of engagement in adult life. More worryingly still it identifies a link between economic disadvantage and low levels of creative engagement. Primarily this is an issue of equity, which demands, as Ken Robinson did also, that we respond. To borrow Anna’s term, we need to ‘possibility think’ our way forwards here in order to move from ‘what is’ to ‘what might be’. In planning to achieve this, through collaborating with children and other adults, (e.g. TAs, parents, and partners from the creative and cultural organisations), teachers will be demonstrating, as Anna Craft did, a deep commitment to fostering creativity in the young, and, if supported, they may also be involved, as Anna was, in researching the consequences of such playful practice on children’s creative learning. As educators, if we afford higher value to ‘what if’ and ‘as if’ thinking, work harder to include children in shaping the curriculum and recognise their own and their teachers need for agency, we will not only be taking Anna Craft’s legacy forward, we will also be cultivating creativity – that potent ‘engine of human growth’. Professor Anna Craft, who died on 11 August at the cruelly early age of 52, was a key figure in the development of the Cambridge Primary Review Trust, a widely respected educational researcher and writer, an outstanding colleague and a true friend. 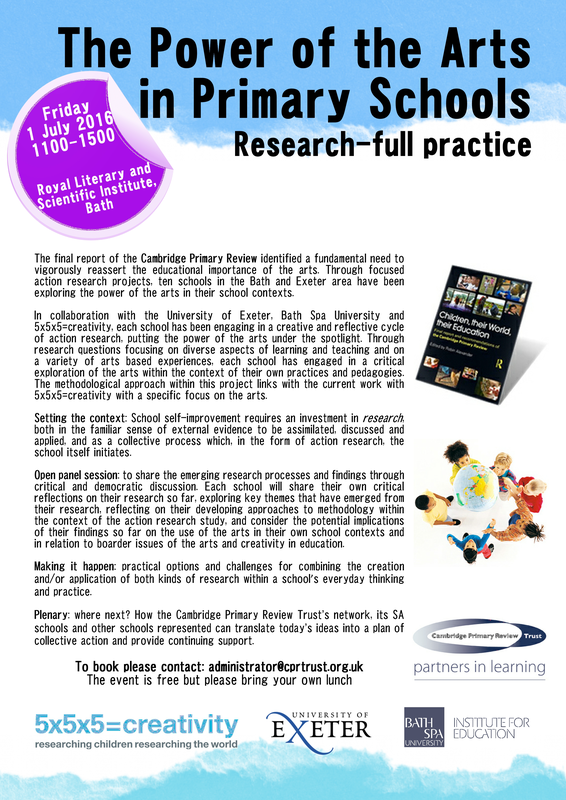 Within CPRT, Anna concentrated particularly on research, and the Trust’s South West Research Schools Network based at Exeter and Bath Spa universities was very much her creation, as was the forthcoming research-based CPD programme on children’s voice on which the Trust is working with Pearson. The common strand was her commitment to making a difference to children’s lives. Heeding children’s voices and helping teachers to enhance their own understanding and skill were central to that quest. 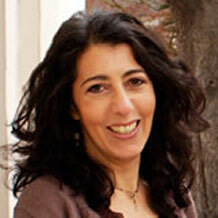 Outside CPRT, Anna simultaneously held senior positions at Exeter University and the Open University, and her research on creativity in education, educational futures and ‘possibility thinking’ is highly regarded in both the UK and other countries. This work is driven by Anna’s concern that today’s complex and fast-changing world requires creative capacities whose development from the early years onwards we neglect at our and our children’s peril. Anna saw creativity as an everyday and lifelong imperative, a problem-finding, problem-solving capability with possibility thinking – the transformation from what is to what might be – at its heart. Creativity in this larger sense includes but also reaches well beyond the arts to encompass a wide array of cognitive and affective capacities that have yet to achieve the central place in children’s education they deserve. Symptomatically, creativity thus defined could well be another of those ‘parts the national curriculum doesn’t reach’. In any event, Anna would have taken issue with the BBC interviewee who claimed that by including art and design, design technology and music, England’s new national curriculum does all that needs to be done for children’s creative development. Anna therefore bequeathes a challenge as well as a vision. The best academic work in education displays not just impeccable scholarship but also a passion for the life-enhancing possibilities of education itself and a desire to persuade others that this is a cause for which we have no option but to fight. That combination of rigour, intensity and integrity of purpose and eagerness to communicate and persuade marked all Anna’s work and reflected the kind of person she was. But the other Anna, noted by friends, students and colleagues alike, was warm, lively, engaging, affectionate, funny – in short the best of company and a wonderful person. We shall miss her. Anna Craft’s funeral is at 2pm on Friday 22nd August near Totnes, Devon. Full details here. Do please add your thoughts and memories below.